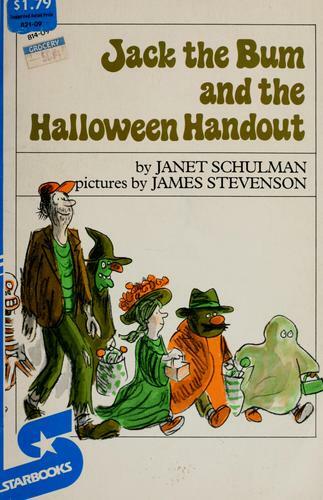 Jack the Bum and the Halloween Handout is a 1977 easy reader about a homeless man named Jack who is inspired by trick-or-treaters to go door-to-door asking for money, not for UNICEF, as many of the children do, but for himself, a self-described "worthy cause." When he is rebuffed again and again by suspicious adults who recognize that he is not a child, Jack ends up stumbling upon a costume contest, which he wins for the authenticity of his bum costume. When it is revealed that he is not in fact dressed up, there is a question of whether he should be allowed to keep the five dollar reward. After some debate, Jack decides he will join in the spirit of the holiday, and he donates his winnings to UNICEF. Ordinarily, I don't like to give away endings in my reviews, but this book is so laughably odd, and so unlikely to be of interest to contemporary children that I have made an exception. This post is really less of a review and more of an amused meditation on how a book like this even exists. The first thing about this book that struck me as unusual is the use of an adult homeless male as its sympathetic and amusing protagonist. During my childhood in the 80s, it was already commonplace to encourage kids to stay away from strangers, and today, I think many parents are even more concerned about potential predators. I can't imagine a contemporary author writing a book like this, which causes kids to sympathize with someone who poses as a trick-or-treating child in order to beg for money. Nothing remotely untoward happens in the story, and I tend to be pretty skeptical of the paranoia surrounding stranger danger, but I couldn't help but think that this is a definite product of the '70s. If this were written today, Jack would have been a child, and his big Halloween reward would have been a caring new family, not a 5-dollar bill. I was also surprised (and amused) by how freely politically incorrect this book is. There are no euphemisms to describe Jack's station in life. He is labeled a bum by the first person he panhandles ("I am a worthy cause," said Jack. "No. You are a bum," said the man.) and is thereafter called a bum as though this is the proper word to describe the poor and/or homeless. I am no more interested in policing speech than I am in vilifying all strangers as potential kidnappers, but apparently even I have been conditioned to cringe at the use of a "label" for a marginalized person, even a label to which the character does not object in a story where the author's attitude toward said character is one of sympathy, not mockery. At the same time, though, there is something refreshing about a book that doesn't take itself seriously. I feel like contemporary picture books are often trying very hard; this one, by contrast, barely seems to try at all! The most baffling thing about this book, however, is the ending. UNICEF is mentioned nearly a dozen times throughout the story, and those characters who collect money for UNICEF are clearly considered to be doing the right thing and putting others ahead of themselves. But when Jack wins the costume contest and it turns out that he is the exact kind of person who could use some financial help, everyone just lets him donate his only five dollars to UNICEF! This book is already so strange that I guess I didn't really expect it to teach a moral lesson, or even to make sense, but I have to wonder what the kids of the late 1970s took away from it. Kirkus seemed to like it at the time, but I don't think even they would feel the same way today. Jack the Bum starred in two other easy readers: Jack the Bum and the Haunted House and Jack the Bum and the UFO. Alas, Open Library, where I found this book, doesn't have either of the other two, so I can only imagine how bizarre they must also be. Personally, I think this one book is enough, and I enjoyed the chuckle it gave me, but I'm in no hurry to pass it on to my own beginning reader. Mostly, I am just entertained by the fact that there was a time when a book like this was written, published, and met with critical acclaim.